I'm pretty sure we were having a better time than we let on in this photo. ;-) Anyway, when I saw that The Australian Women's Weekly was rereleasing the book I knew a copy was destined for my shelf. They've jazzed it up a bit, and some of the classic cakes aren't in the new book (no princess sleeping in a fancy princess bed! Woe is me!) but I imagine it suits the children of the 21st century perfectly. Of course, I had to give one of the cake ideas a go, and the echidna looked striking and easy - a winning combination! Actually, most of these cakes are really simple to make, and the book comes with a set of paper templates in the back of it - you can cut them out and use them to shape the cakes (e.g. for the number-shaped ones). The echidna is an ice-cream cake, so there's not even any baking required. You just line a bowl with gladwrap, fill it with ice-cream, freeze it again to firm up, then add some bits and bobs to make it echidna-like. The book said to use a cream-filled sponge finger for the snout, but I couldn't find those in our supermarket, but I found some almond biscuits which seemed about right. Substitutions of all descriptions are fine - so long as it does the job! Do you have fond memories of this book? What was the best birthday cake you ever had? What a cute cake! 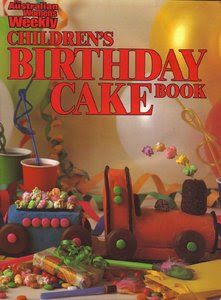 I have so many happy memories from the AWW birthday cake book. Mum would let us choose whatever we wanted and would spend hours creating it the night before our party. My most challenging request was for the train on the cover! Our family copy is almost falling apart now and I've been thinking about getting a copy of the new edition for myself. I bought this book (the old one for nostalga purposes!) when I started working years before we had kids - it may have freaked my husband out a bit!!!! Glad to see the new book isn't all fondant icing - maybe it's just me but I'm all for the traditional icing the fondant stuff seems a bit 'fake'. I am totally going to check this out at the library. Hope your folks were okay in the quakes. Libby, good to hear you put your Mum's cake-decorating to the test with your demands. ;-) The train is the classic! Makeitgiveit, hehe, just like me. Fortunately Mr Cake is used to my special brand of crazy. ;-) My folks were fine - I hope your little ones (or you!) aren't too stressed out and you've been feeling the love! Becs - oh! How funny - I had read about the release but just assumed (since the one I got has so many of the original recipes in it) that it was the new release. Oh well - still a fun bit of reminiscing! Kirstin, brilliant, hope they love it and have fun with it! I thought "That is a rather bizarre attempt at a ladybird cake." I should really read the text, not just scan the pictures.